Following last year’s firing of an Applebee’s waitress who dared to post a receipt from a cheapskate customer claiming to be a pastor who gives “10% to God” and thus shouldn’t be required to pay the 18% tip mandated for large parties, a real pastor at a church in Tennessee decided to create a website to remind churchgoers that they shouldn’t stiff their restaurant servers. 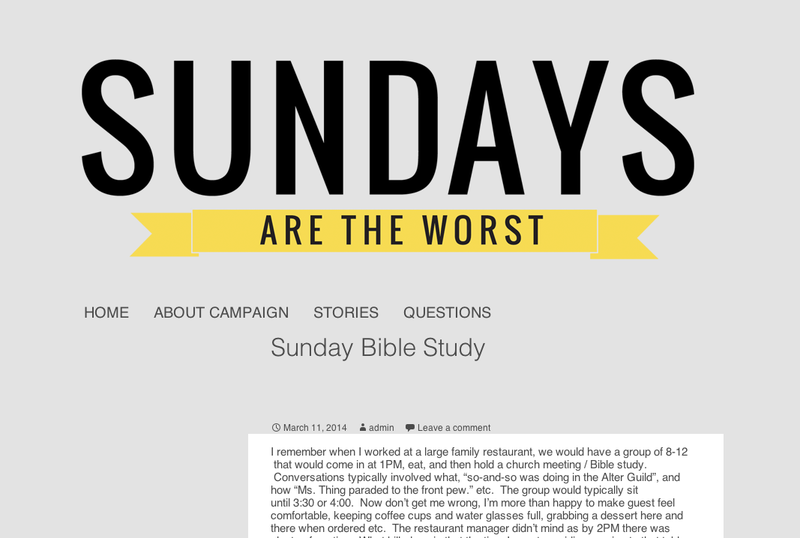 SundaysAreTheWorst.com is a place for servers to share their stories of customers who shortchange the tip, especially for those after-church meals with the family. Chad says he initially tried to create a Facebook page where servers could shine a light on customers who leave thin tips, but employees at restaurants were worried because their employers often had social media policies that made them careful about what they shared online. The site has only been up since the beginning of the month and already has more than 120 stories from servers venting about being stiffed on a Sunday.